Gastly in game: 22,445 Who? Important notice! Pokemon Gastly is a fictional character of humans. 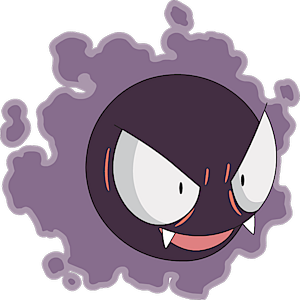 Gastly has no true form, due to its body being 95% poisonous gas. However, it consistently appears as a black, spherical Pokémon surrounded by a purple haze. It has a wide, pink mouth with two visible fangs. Though its eyes seem to extend past its round body, visible eyelids surround them. The toxic gas surrounding the main body can induce fainting and suffocation, and is capable of enshrouding an Indian elephant within two seconds. Because it is mostly gas, Gastly will dwindle away when exposed to strong winds. 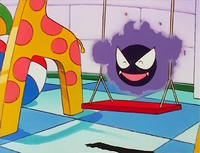 The anime suggests that Gastly has a playful personality, often frightening and playing pranks on people for fun. However, it has shown a willingness to preserve or pass on the memories of departed humans. It has further been shown changing form and composing illusions, and it is capable of phasing through solid objects and forming tangible hands out of its gasses. The anime has shown Gastly living in old, dilapidated buildings, but it can also be found in caves. Gastly first appeared in The Ghost of Maiden's Peak. This Gastly had the ability to talk and shape-shift. He kept posing himself as the spirit of the woman which legend said turned to stone after 2,000 years of waiting for her love to return to her. As the ghost of the maiden, Gastly kept on toying with the minds of young men. The first time a regular Gastly appeared was in The Tower of Terror. Ash and his friends went to Lavender Town in search of a Ghost-type Pokémon to aid Ash in defeating Sabrina. It reappeared in a flashback in the following episode. An Officer Jenny owned a Gastly in Pikachu Re-volts. This Gastly appeared to be the only Pokémon not affected by the psychic wave caused by Butch & Cassidy's Drowzee. A Gastly appeared in A Shipful Of Shivers guarding the Orange league trophy of its deceased Trainer along with a Haunter. Morty used a Gastly to battle Ash in From Ghost to Ghost. In the same episode, multiple Gastly hypnotized Team Rocket. A pair of Gastly were among a group of Ghost Pokémon living in an abandoned mine in Fear Factor Phony. The Ghost Pokémon couldn't stand the partying Psychic Pokémon that lived in the nearby town, so they composed a Haunter-like illusion to scare everyone away. A Gastly appeared in PK15. Lon owns a Gastly that appeared in Scary Hospitality!. It is used by Lon, alongside its Haunter and Gengar, to scare visitors of the "Scary House". A Gastly appeared in For Ho-Oh the Bells Toll!. A Gastly appeared in SM003, during a fantasy. Gastly first appears in That Awful Arbok! under the ownership of Koga, possessing the corpses of dead Pokémon in Pokémon Tower. Red's Bulbasaur manages to defeat it by sucking up the surrounding air with its bulb, along with Gastly's gaseous form, and expelling it in a SolarBeam. In the process, the two also freed Red's rival Blue, who was under its ghostly possession. Gastly also forms as part of the Ghost-type army Agatha sends out to attack the Gym Leaders in As Gastly as Before. She also has a Gastly as a member of her main team. 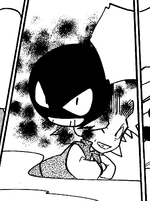 The Masked Man also used a Gastly which it first appeared inYou Ain't Nothin' but a Houndour, in his team to capture Celebi, due to its type advantage. It was purposed to possess intruders that entered the Ilex Forest. Later, during the fight at the Indigo Stadium, it impaired Suicune using its Curse technique, locking it and Misty inside Suicune's crystal wall. It was later defeated by Eusine's Haunter. Morty also has a Gastly which was used along with Misdreavus to battle Suicune in Misdreavus Misgivings . In The Last Battle XIII a Gastly was one of the Pokémon sent to help the fight in Ilex Forest. Many Gastly also appear in the Robust Rotom when Diamond, Pearl, and Platinum spend the night in the Old Chateau. No other Pokémon have the same type combination as Gastly and its evolutions. At 0.2 lbs (0.1 kg), Gastly is tied with Haunter, Flabébé, Cosmog, and Kartana as the lightest Pokémon. 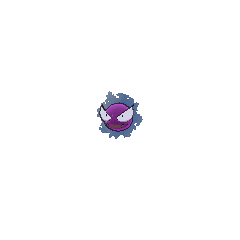 Despite all of them being Poison-type, Gastly together with its evolutionary family are not able to learn Poison-type moves by leveling up. Gastly and its evolution Haunter are the lightest of all Poison-type Pokémon and Ghost-type Pokémon. 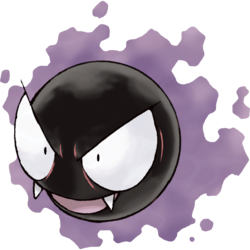 Gastly seems to be based on general cartoonish ghosts and spirits, or maybe a will-o'-the-wisp. It may also have been based on the Japanese yōkai sōgen bi, the decapitated head of a monk whose head is doomed to wander the Earth, consumed by fire. Its Poison type is most likely a reference to poisonous or polluted gases. 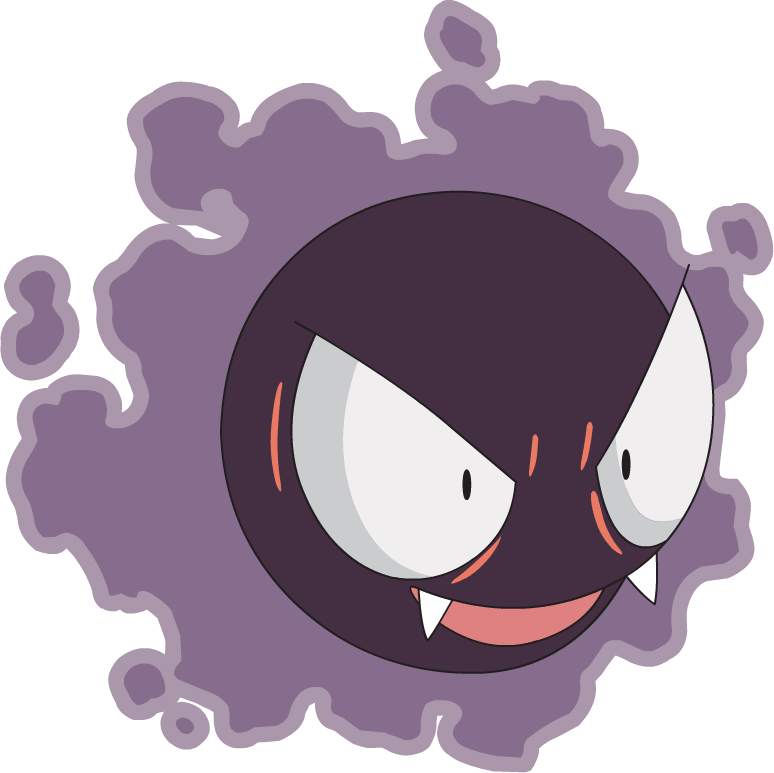 Gastly may be a combination of gas and ghastly (dreadfully frightening or horrible).